With more than 20 thousand page views on 2 posts combined posted here in this blog about the much anticipated Jay Chou 周杰伦大马超时代世界巡回演唱会 The Era World Tour Concert LIVE in KL, Malaysia 2011 with loads of inquiries about it, the ticketing details for the concert itself is finally out and it will be available on sale on Speedy Outlets as well as on www.ticketcharge.com.my starting from 27th of November 2010 onwards. I repeat!!! Tickets will be on sale from 27th of November 2010 onwards! Since the announcement of the concert in KL, fans have been searching up and down for every information they can get and base on research, the demands are extremely high thus resulting in the organisers adding one extra concert to be held in Kuala Lumpur, Malaysia. It will be the first time Jay Chou will perform in Malaysia for 2 nights in a row with a T-Stage incorporated with 3D technology with approx. 2000 LED lights/lasers & etc. 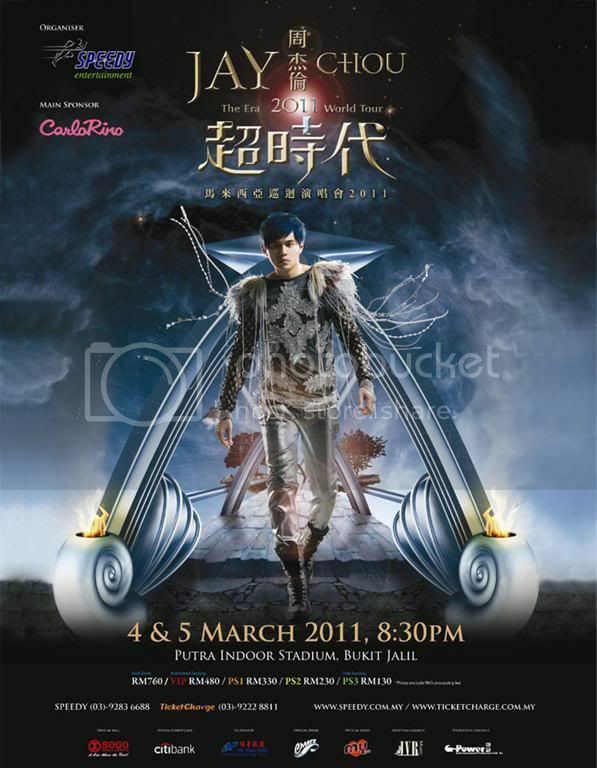 YES, that means that Jay Chou 周杰伦 will be performing for 2 nights on the 4th and 5th of March 2011 next year at Putra Indoor Stadium, Bukit Jalil. Note : Ticket Sales will be happening on the the 27th of November 2010 at 11AM. 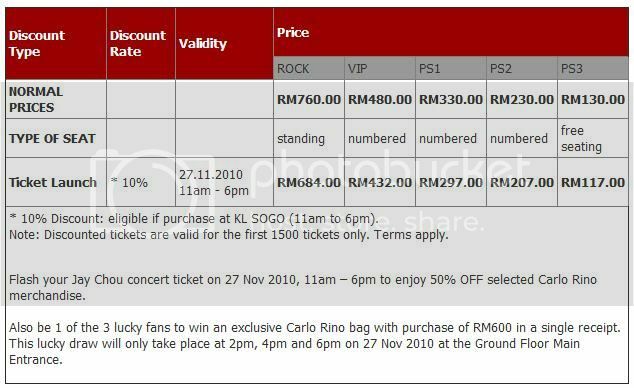 Those who are getting their tickets at KL Sogo Mall on the date itself from 11AM to 6PM will enjoy 10% discount. hey! thanks for the complete information! allow me to copy the content to my blog! and free free to visit me too. jay rocks! Orange area should be PS2 isn’t? Thanks for the info, appreciate. WOHOOOO!!!! MUST GO MUST GO!!!!! lol u so excited ah? is that the ticket available for 2night??? whats the price of VVIP- green zone area!? i have no idea on that..
hope tat day can come fast!!!!!! ehhehehe hope u’ll get the tickets! what does is mean ‘5 star’ on the map rows?? can i ask , will PS1 L14 L13 L1 L2 very behind ? hmmm i’m not sure very behind is how behind for u but it’s the indoor stadium, so i think it should be ok! this is good, thx for sharing! Where to buy tickets at kl sogo mall . Which floor what stall? 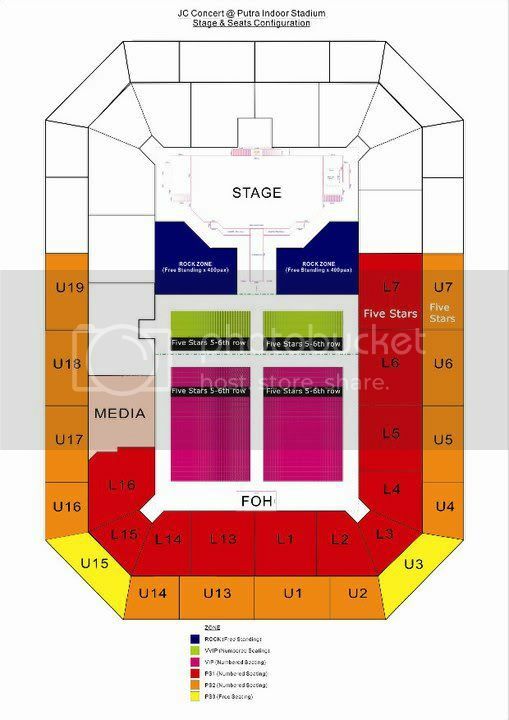 We cannot buy VIP(pink) area it for five stars only? Cannot only buy the tickets? why there write Five Star (5 to 6 row) ? is it other row we can buy? why green zone no price? Got our tickets already for 5 march, excited. i didn’t get any =X ahaa anyways good good u got 4 vip tix!! is there a place (forum) where the concert-goers chit-chat in preparation for the day? wah did u get ur tix in the end? i wan buy vip bit vip habis.VVIP tickets ^^ you got get?? oh means u got the vvip tix ah? what, you’re not going to the concert Josh? whoa, how much is it? > Ojy : good job to u that you called!! haha well one thing i don’t understand is alot of ppl jz kept asking me questions where i’ve already posted the numbers and website details on this post already, good job good job!! Call to ask is a good thing! DOnt lazy to call next concert to prevent your good place “Fly” away! did you go to Speedy HQ to pick up the tickets? must be nice to have them on your hands now. we wont even see the tickets until we arrive in KL on 4 March. please use a scanner so the characters are straight. Our tickets were sent to my friend in KL and will only get them when we arrive on 4 March 2011, he doesn’t have a scanner. Hi guys,..I would like to ask how to travel to Bukit Jalil,…and where is the putra indoor stadium actually? U can travel with StarLRT that goes straight to the stadium, however, you still need to walk to the stadium (5 minutes or so). Putra Indoor Stadium is jz around tat area. Hi, is the concert ticket still selling? Please reply me, thanks you.